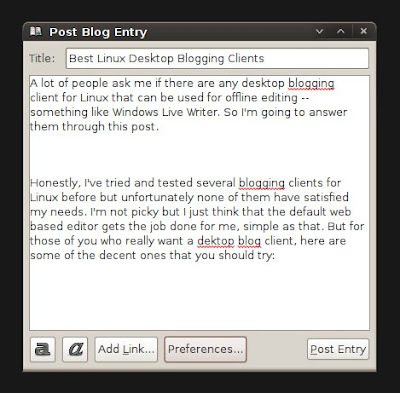 A lot of people ask me if there are any desktop blogging clients for Linux that can be used for offline editing -- something like Windows Live Writer. So I'm going to answer them through this post. Specifically made for GNOME desktop, BloGTK is one of the most full-featured and easy-to-use weblog clients. It supports major blog platforms including WordPress, Blogger, Movable Type, and more. BloGTK makes editing multiple blog accounts a breeze through its intuitive user interface. Written in Python and PyGTK, it is designed to be fast that makes blog posting a lot more efficient. Drivel is another weblog client that is designed for the GNOME desktop. It has just the right amount features making it fast and lightweight. Supported blogging systems include Blogger, Advogato, Live Journal, and more. WordPress shopping cart and Drupal is said to work with Drivel but may need a little tweaking to function well. 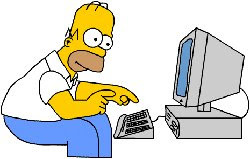 Drivel allows HTML formatting, and you will be able to insert links and images using its editor. For KDE users, you should check out KBlogger. It's in alpha stage of development right now but it's usable. 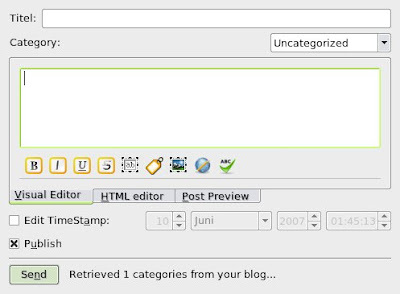 KBlogger is considered as a full fledged blog manager for KDE 4, and supports Blogspot, Wordpress, Drupal, LiveJournal, as well as other accounts. 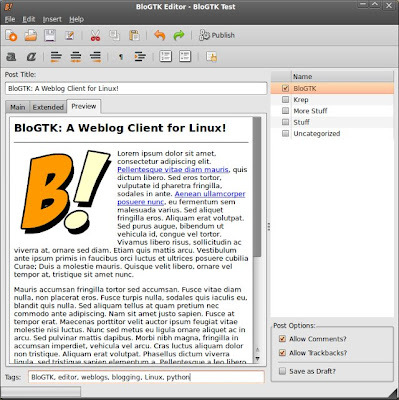 KBlogger is integrated as a Kicker-applet that can be used for quick blog posting. Gnome Blog is a simple blog client that is intended to work as an applet in the GNOME panel. It features a WYSIWYG editor with a clean interface, a spell checker, and drag and drop posting of images. Blog platforms like Blogger/Blogspot, Wordpress, Pyblosxom, etc. are supported. There you have it. If you are not impressed with any of the desktop blogging clients I've listed above, I recommend you install ScribeFire instead. ScribeFire is a popular extension of Firefox.